The different types of greens available in the market can be quite confusing. Vegetable sellers use a common word for most greens. Spinach is loosely used to describe swiss chard and spinach is palak only etc. The most common greens that are available in Kenya are collards which is known as sukuma wiki, spinach which is commonly known as palak and swiss chard which is called spinach. Confused?? Me too !!! However, whatever name these greensare known by, are rich in Vitamin C and A and a good source of fiber.These greens are often used in soups, stews, curries, on its own as a side dish, in salads, with eggs, meat, as a filling etc.The options are endless. The rains bring fresh succulent leaves of all sorts. Whatever we buy, have to washed thoroughly to remove mud, any worms and insects. I bought a huge bunch of swiss chard recently and made a nutritious and filling soup. Though hubby dear finds this weather hot, I love the cool evenings and can’t wait to have soup for dinner.Today I want to share with you this full of veggie soup. Of course, you can add your own selection of vegetables. Did you know that swiss chard can have colourful stems? I didn’t know till I bought some during my last visit to Montreal. A farmer was selling vegetables grown on his farm near a restaurant we had gone to, for breakfast. I saw the colourful stems and was really amazed. Swiss chard with white stem is very common, but with red and yellow stems!!! How colourful the world is! Bought a huge bunch and cooked to my hearts content… not that the colour stayed, it changed on cooking. Heat a pan over medium heat. Add oil. Stir fry the chopped onion, garlic, celery and swiss chard stem till the onion appears translucent. Add tomatoes and cook till they soften a bit. Add stock or water, salt and cover the pan. Let the soup simmer over low heat till the vegetables are done. Add the beans and swiss chard. Cook further till the leaves soften. Don’t overcook the swiss chard otherwise it will turn black. Use any kind of beans you like, I used white beans. Use your favourite seasoning to add a distinctive flavour to the soup. Blanch left over swiss chard to add in omelettes, make quiche, make rice dishes or in a curry. thanks for your lovely comment on my blog and thanks for sharing the different types of greens. Easy to identify them. Btw, soup tempts me so much. 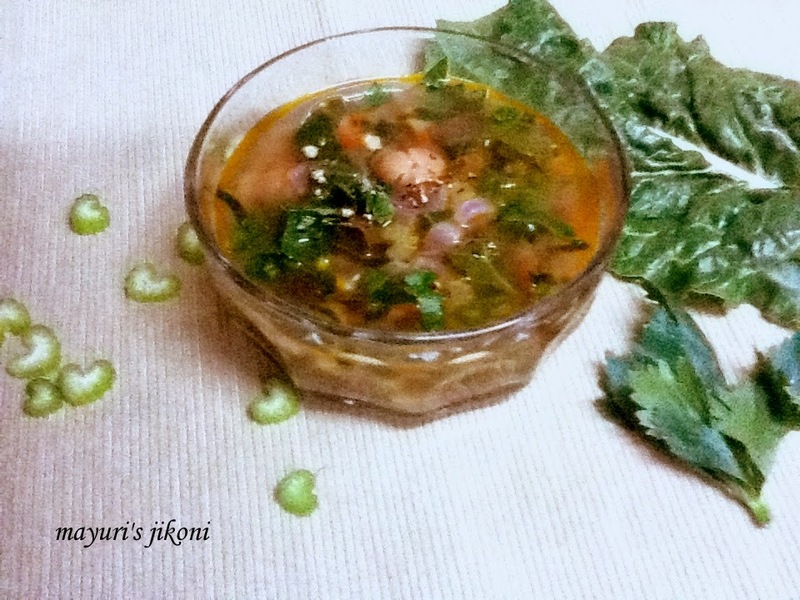 very healthy and delicious soup…….